November 26, 2011 by Venky. Woke up to the sound of rain. Last night’s improper sleep meant the mind was ready to accept it as an excuse and was suggesting me to ditch the ride plans and stay cozy in the bed. The plan was to ride to Savanadurga with Vineet and Shankar. 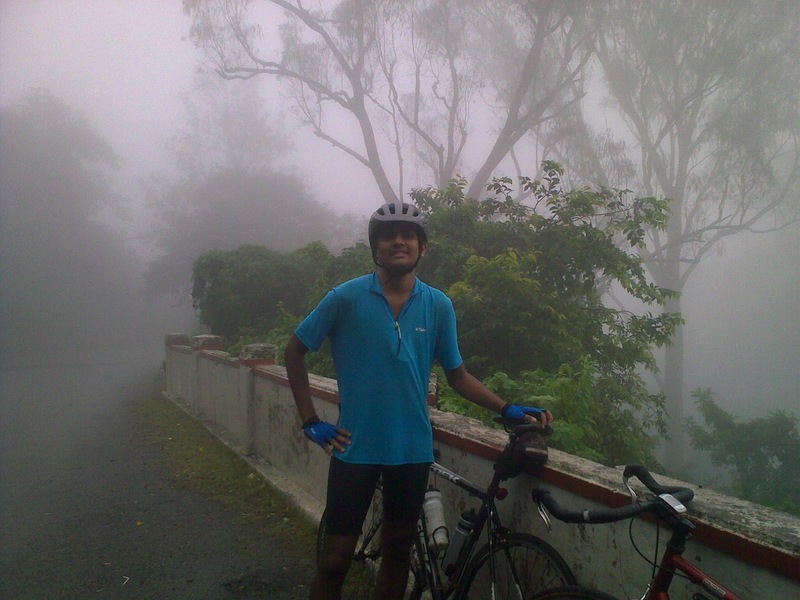 But since the route has some pretty bad sections, Vineet thought it was not a good idea to go that side in rain. I willingly agreed with him. We decided to call it off. But Shankar was keen to ride and suggested doing Nandi. I calmed my lazy mind and got ready and got out. 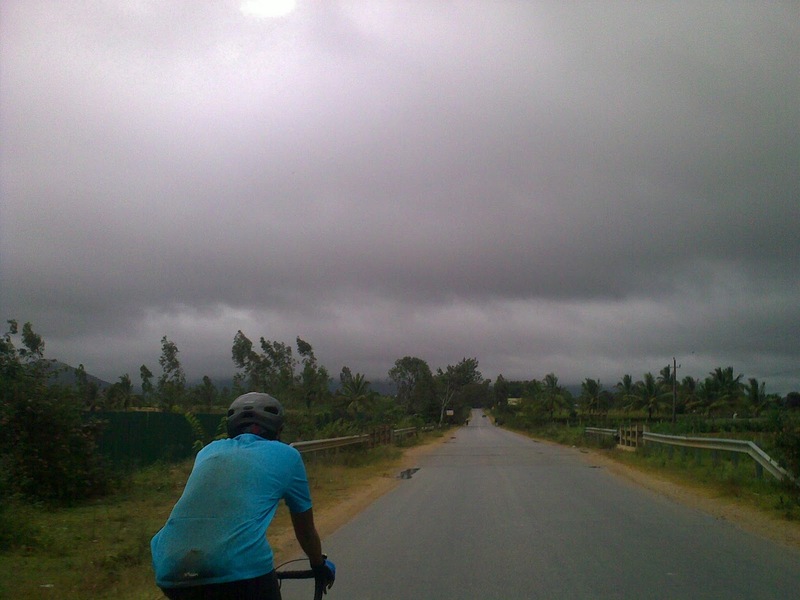 And, I’m so glad I got out and rode, thanks to Shankar. It was a constant drizzle and the roads were quite wet with overnight rains. 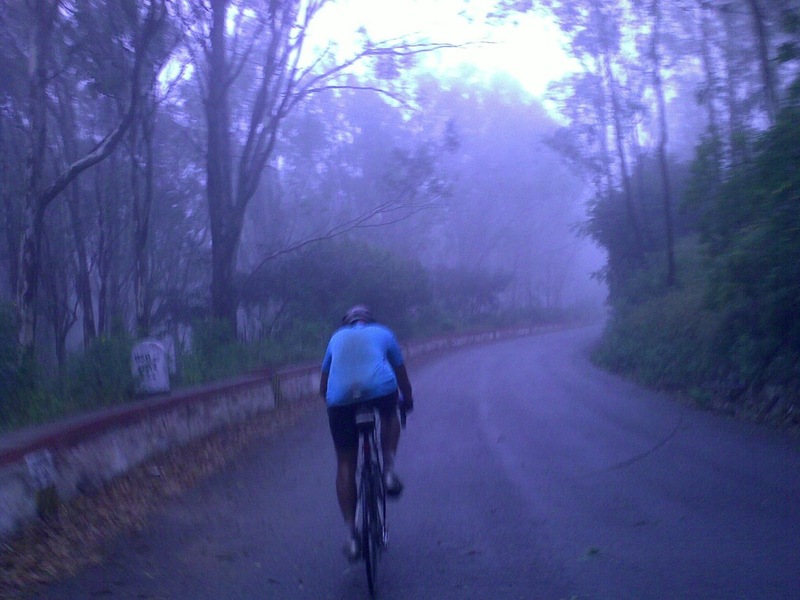 As Shankar and I began to ride together on Siva’s road, my lazy mind began to wake up and enjoy the ride in that twilight and drizzle. We’ve decided to take it easy as the roads were quite wet. As we approached the Nandi turn-off, we heard my name being called out and stopped. It was Akash going back after his morning run on Nandi approach road. 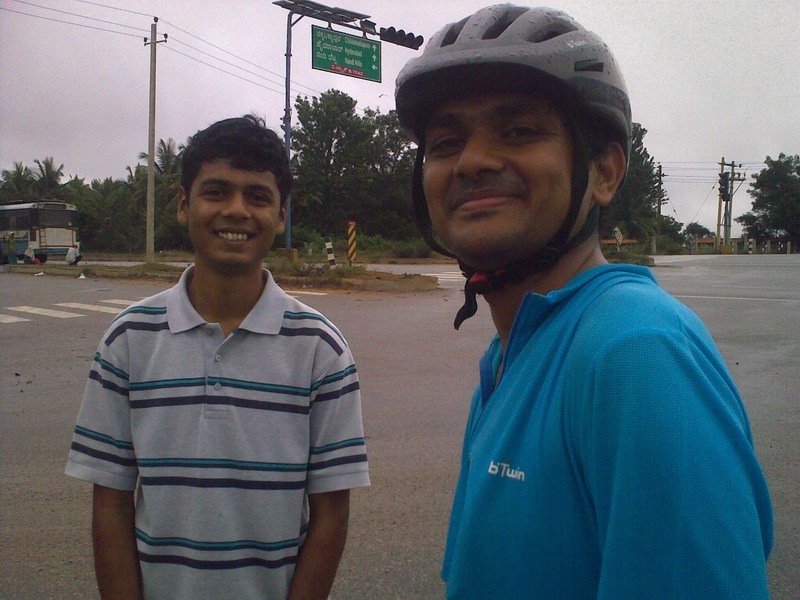 Incidentally, I first met Akash on a similar day a few months back on the same road. We chatted for a couple of minutes with Akash and proceeded to the base. After reaching the base, I wanted to see how far I could keep Shankar in sight on the climb. Was able to manage till 5km after which he took off. After I lost sight of him, the left cleat came off at my nemesis, curve 33, and I had to set my foot down before quickly starting again. Shankar mid-way through the climb where it began to get foggy..
With the majority of the work done, it was just a matter of keeping the rhythm. I kept going with HR well over 170 now but well in control. As always, I took the wider line at the final curve and the arch came into view. Shankar was sitting there relaxing after a great effort. I reached the arch and hit the lap button to see 31:50. So, I guess I could say my PB is now at 31:55 after adding a few seconds for the brief stop at 5.7km. Shankar at the top of Nandi.. Look how beautiful it was there that morning.. The Avg HR for the climb was 170 which was slightly higher than last week’s 166 but slightly lower than 172 of my first Nandi climb. Many be I could have gone a little harder on the initial 5km along with Shankar because I was consistently seeing 165-167 during that section. May have saved a few more secs. Shankar had a PB of 30:20(10secs shaved off his previous). He could have easily gone sub 30 as I could see he didn’t push much in the initial 5km. The sight at top of Nandi was surreal with all the fog. Just after around 5 minutes there, we began to feel quite cold and decided to start back. We had to descend quite carefully keeping the wet roads and low visibility due to fog in mind. The ride back from base was quite windy. The crosswinds and headwinds were quite a challenge. We tried pacelining but nothing seemed to help in those winds. At a few places the crosswinds were literally pushing us off the road. We crawled back home after yet another satisfying Nandi climb. Thanks Shankar for the company and for the ride.